This page is an unofficial one under the Center for Indian Military History's Regiments of the Indian Cavalry Project. You may reproduce material by informing the Publisher in advance and providing proper citation. The history of the Indian Army’s 8th Light Cavalry spans over 2 centuries. It was raised on October 23, 1787 as the 5th Regiment Madras Native Cavalry, part of the erstwhile Madras Presidency Army. One of the oldest cavalry regiments of the Indian Army, the unit has seen action in theatres of war in Europe, the Middle East as well as South Asia and has 13 Battle Honours and several gallantry awards to its credit. The 5th Regiment Madras Native Cavalry was re-designated as the 1st Madras Native Cavalry in 1788 and in 1816 its name was changed to 1 Madras Light Cavalry. The Regiment was yet again re-named as the 1st Regiment of Madras Lancers in 1886, by which way it was known till the turn of the century, when its nomenclature was changed to 1st Madras Lancers. In 1903 it was re-named as the 26th Light Cavalry and three years later it became the Prince of Wales Own Light Cavalry and then in 1910, it became the 26th King George’s Own Light Cavalry. The year 1826 witnessed the birth of another illustrious regiment, the 4th Nizam’s Cavalry, raised as part of the Hyderabad Cavalry. It later re-christened as the 30th Lancers and also came to be known as Gordon’s Horse after Sir John Gordon. In 1922, the two regiments were amalgamated to form the 8th King George’s Own Light Cavalry, inheriting in the process, the traditions and rich heritages of two cultures. 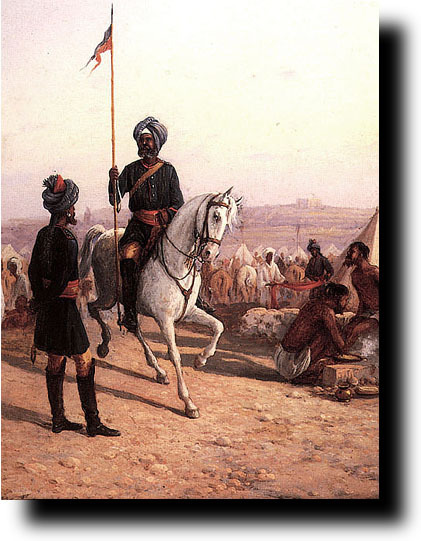 After India attained independence, the regiment was renamed as the 8th Light Cavalry. The 1st Regiment Madras Native Cavalry, in its infancy, saw action in Burma and Afghanistan, where it earned the Battle Honours AVA and AFGHANISTAN, indicative of its magnificent performance in both these theatres of war. Then came the Great War and the 26th King George’s Own Light Cavalry was moved to South Yemen as part of the Aden Field Force, where, keeping in the traditions of the regiment, it performed brilliantly. During this war, 30th Lancers saw action in France where, though being a cavalry regiment, it received a good taste of trench warfare. It then went on to extinguish the embers of an Arab rebellion in Iraq, before going into action in Persia. By this time, the regiment had earned 12 Battle Honours. With a meritorious history of over a century, it became befitting for King George – V, Colonel of one of the regiments to become the Colonel-in-Chief of the amalgamated regiment. Field Marshal, Lord Chetwode became the first Colonel of the Regiment in 1936. It is Lord Chetwode’s immortal shibboleth – “The safety, honour and welfare of your country come first, always and every time. The honour, welfare and comfort of the men you command come next. Our own ease, comfort and safety come last, always and every time”, which became the credo not only for the regiment, but for the entire officer corps of the Indian Army and is etched in main hall of the Indian Military Academy at Dehradun. In 1940, the Regiment bid farewell to the horses and began the long and arduous process of mechanisation. It was fully mechanised by 1943 on armoured cars. It executed its first mechanised operation in 1945 in Burma, where it earned 19 gallantry and distinguished service awards in this single operation. Post independence, the regiment had the privilege of participating in al major wars fought by the Indian Army – Hyderabad 1948, Jammu and Kashmir 1949, Goa 1961, China (Sikkim) 1962, Pakistan (Punjab) 1965 and Pakistan (Jammu and Kashmir) 1971. The operations in Hyderabad had just been over, when the regiment was moved to Jammu and Kashmir. During the Liberation of Goa in 1961, the regiment spearheaded the attack which led the Portuguese to surrender. The history of mechanized warfare was re-written by the regiment in 1962, when it drove its tanks to the dizzying heights of 14,000 feet up the Nathu La road in Sikkim – a feat never performed or attempted before anywhere in the world. Khemkaran in Punjab witness the regiment in tank-versus-tank encounters with Pakistani forces resulting in the battlefield become a “graveyard” for Pakistani Patton tanks. Here the regiment earned the Battle Honour PUNJAB. The 1971 Indo-Pak war saw the regiment among the Indian forces which had wrung the tactically fragile Chicken’s Neck in the Akhnoor Sector. The Regiment’s crowning glory came in 1976, when in recognition of its services and valour, the regiment was presented the Guidon by the then President, Mr Fakhruddin Ali Ahmed. Presently equipped with T-72 tanks, the Regiment had, in October 2004, observed its reunion, held after a gap of 17 years, at its location in Western India. A large number of regimental and retired officers as well as other ranks joined in the variety of functions organised to mark the event. The General Officer Commanding in Chief, Western Command, Lt-Gen Daljit Singh is presently the Colonel of the Regiment. All content © 2006 CIMH. Reproduction in any form prohibited without express permission.